Listening to online radio (or even offline) is something I won’t recommend for focused productivity. That’s like tiptoeing around a task with the added distraction. But I agree…sometimes you just feel like it. I also switch on my favorite online radio station (who listens to offline radio stations these days?) especially when I am doing some ho-hum work on the browser and just want to prevent the yawns. We don’t have music services like Spotify and Pandora yet. Last.fm subscription via PayPal is restrictive in my country. So, I am grasping at straws here. Thankfully, there are quite a few straws I can clutch. Radio Player Live is the one that fell into my hands recently. The online radio extension for Chrome has also been recommended on The Best Chrome Extensions page. After spending a few mornings on Radio Player Live, I think I agree with the recommendation. The question is – will you? After installing the Chrome extension, you click on the extension’s icon to launch the mini-player with an absolutely blank interface. Don’t worry; we will be filling it up with our favorite radio stations in a little while. All the riches lie under Options. You won’t be able to listen to anything unless you catch the thousands of radio stations that are being aired live and for free on the web. That’s going to be the first order of the day as we dive into the extension’s Options page. Skipping the sections on General Settings we go straight into Add Radio Stations. There are many ways you can search for and select radio stations. I wouldn’t recommend the manual option straight up because you just might want to get it up and playing instead of hunting for MRLs (i.e. the URLs for streaming radio stations). The quicker option is adding the stations from the gallery itself. Radio Player Live gives you about 307 choices to play with. Clicking on the icons instantly adds the radio station to your list. 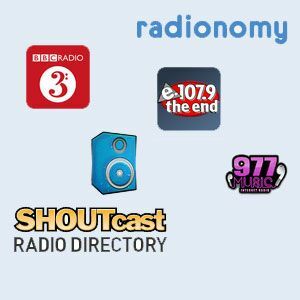 You can also add stations from Shoutcast.com, Radionomy.com, GoomRadio.com, MikesRadioWorld, or di.fm (Digitally Imported). Just visit these sites and click on the extension’s logo which appears next to the station. Oh well, the difficult part’s over. Managing you stations isn’t much of a big deal if you have only a few stations lined up. But if there are a handful, for the sake of neatness, you can organize them around specific genres. You can use the genres / categories the stations came with or define your own new ones. You can test the stations and their quality by clicking on the Play button. Don’t like it – delete it. You can also export your settings and import them back. There aren’t any pre-set themes, but you can customize each part of the player. The color picker is the tool for the job for the guy who is willing to put in the time. Don’t forget to save the new theme when you are done. The player is simple as they come. Perhaps it is the way to go as the simple uncluttered interface just helps you get on with the business of playing the songs. The default player is built with HTML5. Radio Player Live also gives you a VLC plugin but I didn’t try that out as I like the independence of a HTML5 player. I would have liked the ability to drag and drop categories /genres and re-order them around. You can move around the stations within each category though. My leanings are more towards music rather than current affairs and news. There are good pickings in the former, the latter I leave to you to tell me in the comments, though I got Voice of America, NPR, and BBC from the directories. With online radio it boils down to the choice of stations. Radio Player Live did not disappoint as the smorgasbord is rich. The Shoutcast directory alone gives me access to 54,000+ stations. Radionomy bumps up that count considerably. World music is amply covered; the default 307 stations maybe European centric with some from Brazil and U.S. thrown in, but the other catalogs are there for you to tap. Radio Player Live is also light on system resources and it did not hamper my browsing in Chrome in any way as it used up around 54K of system resources. Buffering went without hitch and it was really easy listening. Do you feed your ears with online radio? Which is your tool of choice? Try out Radio Player Live and switch back here for a feedback. Explore more about: Google Chrome, Internet Radio. Aye, I use Pandora but this looks really promising!